These crafted item variants are created by crafting an item in the usual way, and adding an extra optional component. 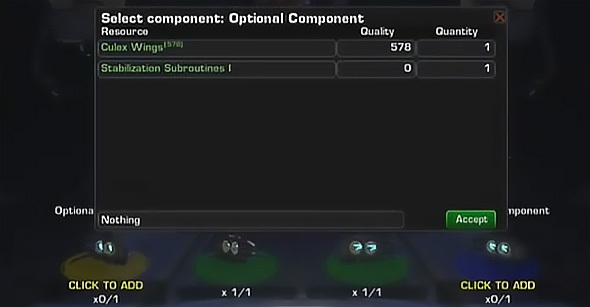 These optional components are dropped by different enemy types, and their quality depends on the stage of the creature that dropped them. The component quality will affect one attribute of the modified behaviour, and these components also increase the constraints cost of the item just as ordinary components do. Adding one of these components will permanently change the behaviour of the item you’re crafting, so you’ll probably want to keep the ‘vanilla’ versions of these items around as well, to use in other situations. The introduction of this system adds new behavioural variants for all the Accord frame primary weapons, and two abilities per Accord frame – one damaging ability and one “utility” ability. Because these are all Accord abilities and weapons, this gives the advanced frames a chance to try out these variant abilities as well. This replaces Scattershot Alt Fire with “Dragon’s Breath”, shooting a burst of fire forward in a cone. This adds a Blast Shield to Crater. Blast Shield spawns centered on the impact site of Crater. This replaces alt fire with Plague Blaster, which increases the amount of damage enemies take when hit by the alt fire. This effect also spreads to nearby targets. Quality modifies: Enemy accuracy reduction. This adds Blinding Fumes to Poison Trail, decreasing enemies’ accuracy while in Poison Trail. This adds a Phase Unit to Triage, which allows the player to be able to pass through enemies/allies causing damage to enemies and healing allies. This adds an Upgraded Forward Shield to the HMG alt fire, creating an improved full-body shield. This adds a Damage Reflector which harms enemies that hit the Dreadnaught while Heavy Armor is active. This adds a Magnetic Repulsor to Repulsor Blast, drawing enemies in to the Dreadnaught before Repulsor Blast is fired. This adds Burrowing Explosives to Sticky Grenade Launcher, which applies a Damage over Time effect to the area that they were detonated on. This adds High Capacity Arcfold Tech to the Supply Station, replacing health pickups with HKM powerups. 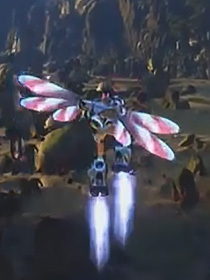 This adds Rocket Turrets to Heavy Turret, adding rockets to the projectiles fired. This adds tech to increase the magnification when zooming with the R36. This adds AI behavior to Decoy which allows Decoy to move and shoot before it explodes. This adds a Frost Burner to Cryo Grenade, which increases Cryo Grenade damage. It applies a DoT that burns the target top on of slowing them. I’m a little confused. Will only these skills be modifiable or every skill? How about advanced frames’ skills? Thanks for the info. It sounds like an interesting idea. At the moment, only these specific weapons and abilities are adjustable using this system, but I think it’s very likely that more variants will be introduced in future updates once Red5 has the system working the way they want it to. As for advanced frames, none of their specific modules have variant behaviors yet, but they can always fit Accord equipment in the meantime. Awesome. I like the idea although I do foresee a lot of identical builds atm. Can’t wait till they implement new variants. It seems like a great idea. I just would like to see them make 1 ability and give you 10 choices to augment it to your liking. Yeah, I’m certainly looking forward to having choices for each ability. I love options! Also, I believe there is a thread on the FF forums asking for testers to list some ideas for future ability change ups thru crafting. Rocket Turret!! I can’t wait! I don’t recall seeing any of those item drops. I assume they will be added in the same patch. Any idea of their rarity? Side note: I’m waiting for when we’ll be able to craft armor with enhanced protection against fire/blast, toxins/acids, and power surges. They are indeed new drops. At the moment they’re fairly rare on the PTS, but that may change when it goes live – Red5 has said on the forums that they’re still tweaking the rate at which they enter the economy. What exactly is blast shield on crater? Is it heavy armor, is it thunderdome, is it like electron’s bulwark? No idea yet; “blast shield” is all I know. We’ll be experimenting as soon as we get some drops, though! Thinking ahead, there’ll probably be a need for a decent list/table that not only shows what abilities can be modified (and with what) but also a table that shows where you can get these components. Some might be obvious (Brontodon Ivory for example) but not everyone might think to kill Chosen for Explosive Devices. Yeah, I was thinking of tabulating the basic information – everything is there in the list but it’s not the easiest to sort through, and it’ll just get harder as they add more items like this. It’s a really interesting system with a lot of potential – I can’t wait til they expand on it! There we go – I’ve put in a table which will serve for now; obviously it’ll need to be reformatted a bit once we get more items to add to it. But this is an awesome start! Thanks a bunch! Nice work. I would just add a column for Quality and indicate how it affects crafting–for example, duration, radius, damage/heal, range.